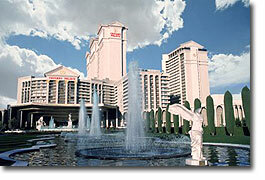 Caesars Palace, where you'll find a world resplendent in regal pleasures. A zenith of impeccable service, lavish accommodations, exquisite cuisine, splendid recreational opportunities, magnificent entertainment and championship sporting events. A world which puts the comfort and the enjoyment of its guests above everything else. The luxuries at Caesars Palace are recognized and honored around the world. Caesar's casino offers some of the finest gaming in the world. Now, the Palace is even more spectacular. The new 29-story tower features spectacular new rooms, a massive new fitness center and spa, three ballrooms and meeting areas large and small. The Palace now offers 2,410 lavish rooms, all with unbelievable luxury, the finest linens, elaborate baths and luxurious décor. Many rooms offer Roman tubs, spas, saunas and veiled beds beneath mirrored ceilings. All rooms in the new tower have nine-foot ceilings and feature Caesars signature luxurious bath with large whirlpool spa tubs, two-lined telephones with data ports, ironing boards, irons, hair dryers, in-room safes, small refrigerators, bathroom telephones and generous closets with motion-sensor lighting. The Forum Shops and The Appian Way offer more than 100 quality merchants and restaurants for a fantastic shopping and dining experience. Such names as: Gucci, Bernini, Versace, Guess, Brittany and Company, Cartier, Marshall/Russo, A/X Armani, Alfred Dunhill, Bebe, Christian Dior, DKNY, FAO Schwarz, and more. 23,000 sq. feet state-of-the-art retreat. Latest work-out equipment, whirlpools and racquetball courts. 6,500 sq. foot fitness facility featuring virtual reality stair-steppers and bicycles, full range of cardiovascular equipment and weights. Private mens and womens V.I.P. message suites and lounges complete with private Jacuzzi tubs. Caesars Magical Empire, a unique magical dining and magic show experience. Top name entertainment in the Circus Maximus Showroom. 4.5 acres of the most impressive outdoor swimming pool area ever created for a total of three pools measuring 22,000 square feet. All Children 11 and over will be charged as an adult. Caesar's Palace offers you the choice between a King bed or 2 Double beds.